Since at least 1908, Peruvian students have been attending the University of Illinois. Early Peruvian Illini have included actors, agriculturalists, agronomists, architectural engineers, architects, chemical engineers, civil engineers, dairy administrators, educators, electrical engineers, linguists, mechanical engineers, musicians, physicists, and student leaders too. Read on to learn more about early Peruvian Illini! While some early twentieth century Peruvian history is documented in the University Archives, it may be the 1960s when Illinois-Peruvian connections significantly deepened in multiple fields of research. But first, it is the papers of USDA Agronomist Harry V. Harlan (Record Series 8/6/25) which document crop research, rail travel, and his experiences visiting Cusco and Juliaca, as early as 1914. While a few decades later, in 1941, alumni John L. Strohm (Record Series 26/20/75) visited Huancayo, Lima, and Paramonga, during his ambitious tour of the Americas. Although, it may be that earliest documented faculty work in Peru can be read in the Denton E. Alexander Papers (Record Series 8/6/27) which document his work concerning Peruvian corn genetics, during the 1960s. Meanwhile, in the CIC-AID Rural Development Research Project File (Record Series 8/4/40), curious researchers can also read comparatively about Iowa State University and North Carolina State University work in Peru too. While the Symphony Orchestra Central and South American Tour Scrapbook (Record Series 41/65/16) documents the 1964 State Department sponsored tour of Illini performing across Central and South America. The first Illini in Peru might have been Mr. Hale Plahn Daugherty, (A.B. Liberal Arts and Science, 1914), who was born in Peru, in 1892, to parents from Hamilton, Ohio and Beardstown, Illinois. Mr. Daugherty would later prepare at Peoria High School, before coming to Illinois. After graduation, Mr. Daugherty became an advertising manager for George La Monte and Son, in New York City. Just ten years later graduated Mr. Martin Tuttle Chamberlain, (B.S. Architectural Engineering, 1903), of Muskegon, Michigan, who prepared at Muskegon High School before coming to Illinois. After graduation, Mr. Chamberlain first worked as an engineer in cities including Chicago, Youngstown, Seattle, and Calgary, before heading an expedition to Peru in 1916 and 1917. Meanwhile, on campus, an even richer set of Illinois-Peruvian stories was under development as the Peruvian student population was on the rise. The earliest Peruvian Illini might have been Mr. Carlos Luis Traverso, (LA 1908-1909), of Cajamarca (also Kashamarka in Quechua), who began his U.S. studies at Illinois; but, he later completed his bachelor’s degree at the University of Michigan in 1911. While he was a student at Illinois, Mr. Traverso donated to the Italian Illini and Cosmopolitan Club (Record Series 41/64/8) fundraiser for the 1908 Messina Earthquake in Italy, and he even played the character of Don Nunio de Artial in a 1909 Spanish Club production of García Gutiérrez’s “El Trovador”. By 1918, Mr. Traverso had returned to Peru where he worked as a teacher, the Daily Illini reported. The next two Peruvian Illini were brothers from Arequipa. First, there was Mr. David Dasso, (Mechanical Engineering, 1909-10), who studied at the School of Engineering in Lima, before coming to Illinois. Mr. Dasso might not have left many records behind, accept his attendance at 1910 Cosmopolitan Club banquet. While just two years after David, Luis Dasso came to Illinois to study Architectural Engineering, (1912-14), although, he too may not have left many records behind. A 1913 Illio profile photo of Mr. Hector J. Boza, found in Record Series 41/8/805. And so, the first Peruvian Illini to graduate might have been Mr. Hector Julio Boza, (Civil Engineering, 1911-12), who studied at the Institute of Lima and “Missouri School of Mines”, before coming to Illinois. Mr. Boza attended at least one civil engineer class tour of Chicago institutions in October of 1911, and he was a competitive checkers player too. In fact, Mr. Boza almost won a 1912 campus championship too. A 1915 Illio profile photo of Mr. Federico Basadre, found in Record Series 41/8/805. The second Peruvian Illini graduate might have been Mr. Federico Basadre Grohman, (B.S. Civil Engineering, 1914), of Tacna, who attended a high school and a school of engineering in Lima, before coming to Illinois. After graduation, Mr. Basadre worked as an engineer in multiple South American countries, including Peru, Brazil, and Argentina. A 1918 Illio group photo of Club Latino-Americano, with Mr. Emigdio and Mr. Daniel (front row, third and fourth from left), found in Record Series 41/8/805. 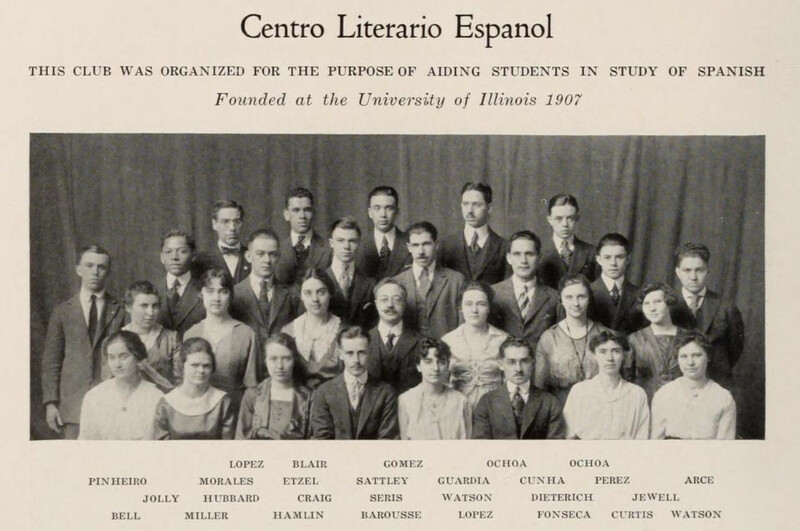 The following year, three brothers from Arequipa enrolled at Illinois. First, there was Sergio Arturo Huaco, who studied for solely the summer. Then, there was Daniel Octavio Huaco, (Communications, 1915). Later, there was Sergio Arturo Huaco, (Liberal Arts). Finally, there was Emigdio Nieves Huaco, (Agriculture), who was the 1916-1917 Latin American Club treasurer. Mr. Daniel Huaco left behind the most records on campus. We know that he was a public speaker, evidenced in 1915, when he gave a talk on the Incas of Peru. We also that he was a frequent campus performer too. That same year, during the 1915 Spanish Night, Mr. Huaco played the guitar while his brothers sang. In fact, he was likely a mandolin player too, documented in two The Daily Illini advertisements (October 22 and 23, 1915). While in 1916, he performed in the Spanish Club productions of “Huyendo de Perjil and “La Muela del Juicio” too. Finally, we know that he was a student leader too, when considering that for academic year 1916-17, Mr. Huaco was both the Spanish Club president and the Latin American Society president too. Meanwhile, Mr. Roberto Agramonte, (Agriculture, 1917-1918), of Arequipa, may not have left many records behind (besides his image in the Club Latino-Americano photo above). A few years later graduated Mr. Maximo Eladio Morales, (B.S. Chemical Engineering, 1921), of Lima, and Mr. Manuel Fonseca, (B.S. Agronomy, 1920), of Callao, who were frequent performers in Spanish language cultural events on campus. Some campus collaborations included: singing duets for accompanied for January 1920 Latin American Club social; the May 1920 Spanish Club social; the October 1920 Spanish Club social; the December 1920 Cosmopolitan Club International Night; the 1920 Y.M.C.A. Stay-Over Christmas Service; the March 1921 Spanish Club social; the 1921 Cosmopolitan Club International Night; and the July 1921 Spanish Club social. A 1921 Illio profile photo of Mr. Maximo E. Morales, found in Record Series 41/8/805. From DI reporting, we know that Mr. Morales began his studies as a civil engineer but he would later complete his bachelor’s degree as a chemical engineer. While at Illinois, Mr. Morales was active in student life. Mr. Morales performed in the 1919 Spanish Club production of “Después del sol de lluvia“; he was the 1919-1920 Latin-American Club treasurer; he sang multiple songs for the 1920 Cosmopolitan Club social mixer and smoker; he sang another solo for a December 1920 Spanish Club social; he arranged the 1921 Spanish Club Party; and he was even captain of the Fall 1921 foreign student soccer team. He was a writer too. On the centennial of Peru’s independence, Mr. Morales wrote a detailed memorial on the past century of Peruvian history. And before graduation, it was February 5, 1921, when Mr. Morales married Grace Watson (B.A. Liberal Arts and Sciences, 1921), of Arthur, Illinois. After graduation, Mr. Morales taught chemistry at a Mexican state school of agriculture, The Daily Illini reported. A 1921 Illio profile photo of Mr. Manuel Fonseca, found in Record Series 41/8/805. From DI reporting, we also know that Mr. Fonseca began his studies at Valparaiso University, before coming to Illinois. In Spanish Club, Mr. Fonseca was the Spring 1918 Spanish Club secretary and he would be elected president for four terms. He was also a 1919 Y.M.C.A. board member. At the same time, he was elected Latin American Club president for six consecutive semesters, a 1919 Y.M.C.A. Friendly Relations Among Foreign Students committee member, a 1920 Wesley Foundation international committee on the foreign student, and the 1921 Cosmopolitan Club International Night program Chair during his last semester too. In the 1920 Spanish Night performance of “Mas vale mana que fuerza”, he played the role of Antonio. He was part of a 1920 six-student panel presentation “Present Conditions in My Native Country” for the Champaign Chamber of Commerce. While in December 1920, unfortunately, Mr. Fonseca was among the quarantined students during a recent outbreak of Scarlet Fever. 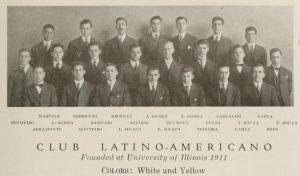 The illness affected multiple Latin American Illini, resulting in a postponement of the much-anticipated Latin American Club reception before winter break. Mr. Fonseca was a recognized student leader for fostering community across cultural and national identities, as remembered in a DI announcement of his departure after graduation. Upon arriving on campus, Mr. Fonseca observed “prejudice among foreign students” and he “set to work to overcome this”, the DI quoted him. As a student leader of Latin-American Club, Mr. Fonseca was remembered for being committed to opening campus interest in Latin America beyond Latin American students. For the 1921 Cosmo Club International Night, as Chair, Mr. Fonseca not only moved the event venue to the larger University Auditorium, he sought international student performers to arrange an international music showcase, and he wrote playlet “International Friendship at Illinois” to portray how international students experience difficulties during foreign study. The playlet featured a fictional international student whose character changed over the course of four years of study at Illinois. After graduation, Mr. Fonseca returned to Peru to work at a government experiment station in 1921. 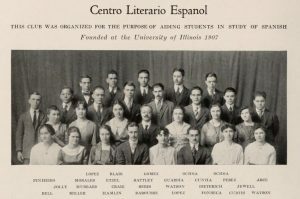 A 1919 Illio group photo of Centro Literario Espanol, with Mr. Fonseca in the front row (third from the right), found in Record Series 41/8/805. While Mr. Santiago Barrenechea, (Medicine), of Chiclayo, and Mr. Victor Ferro, (Mechanical Engineering), of Lima, might not have left many records behind. Mr. Carlos Casas Roggero, (Electrical Engineering), of Lima, was a member of Cosmopolitan Club too. In fact, in 1921, Mr. Roggero briefly left the University to work as an insurance broker in Chicago, before returning to campus the following semester. We do know that Mr. Alfonso Ezeta Boza, (Agronomy), of Lima, was active in student life. Mr. Boza was the Spring 1920 Spanish Club secretary and Spring 1921 treasurer, he performed “the little brother” in the 1921 Spanish Club program performance of “A Shattered Romance”, a local Catholic foundation campus drive team captain in 1922, and he was an intramural soccer player during his junior year too. While he did not graduate, Mr. Boza transferred to nearby Millikan University to continue his studies. And Mr. Carlos Trelles, (Mechanical Engineering), of Puira, might not have left many records behind either. A 1928 Illio profile photo of Mr. Fernando A. Belon, found in Record Series 41/8/805. Mr. Fernando Belon, (B.S. Agronomy, 1927), of Arequipa, might not have left many records behind. A 1930 Illio profile photo of Mr. Luis Arnillas, found in Record Series 41/8/805. Mr. Luis Ernesto Arnillas, (B.S. 1929), of Arequipa. 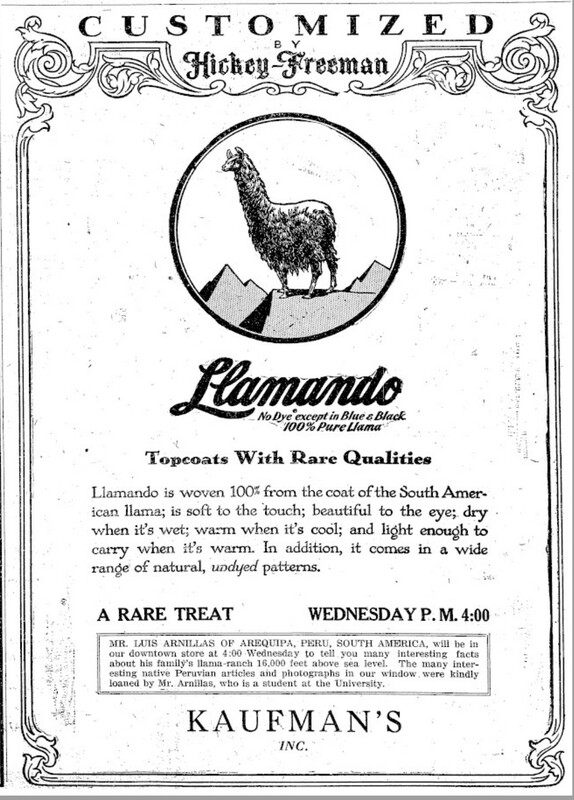 In 1929, he gave a local talk about his family’s llama farm, and he even lent personal photographs of Peru for display at the local business Kaufmans. In the summer of 1929, Mr. Arnillas enrolled in the University’s summer coaching school. A 1929 Daily Illini advertisement for top coats, as well as an exhibit and talk by Luis Arnillas, found in Record Series 41/8/801. Mr. Jose Alfredo Arnillas, (Agricultural Engineering) , of Arequipa, was an active athlete. In December 1928, despite a good first two rounds, Mr. Arnillas lost to Larry Wells for the bantamweight crown. In January 1929, he competed and he was awarded the runner-up title in his weight class when his opponent failed to appear. In a March 1929 match, Mr. Arnillas may have had a bad first round and suffered a technical knockout. In March 1930, Mr. Arnillas was a co-signer to a student petition to change University policy to permit the use of University grounds for sports. The following month, he won a free ticket to the Orpheum theater in a contest for correctly naming nearly all of the movie stars of the recent film “Happy Days”. Finally, during senior year, Mr. Arnillas participated in the Spring 1930 checkers tournament hosted by the Y.M.C.A..
Mr. Samuel Huaman, (Architecture), of Lima, prepared at Uni High, before enrolling in Illinois. While at Illinois, Mr. Huaman joined Cosmopolitan Club in Fall 1927, and he competed in intramural tennis too. While Mr. Alfredo A. Benavides, (Civil Engineering), of Lima, might not have left many records behind. A 1935 Illio profile photo of Mr. Alfonso Montero, found in Record Series 41/8/805. We do know that Mr. Alfonso Montero, (B.S. Chemical Engineering, 1935), of Lima, was initiated into Phi Eta Sigma in 1934. Mr. Marcelo Escomel, (B.S. Engineering, 1947), of Lima, was a Cosmopolitan Club member too. In 1943, he played for the Cosmo Club intramural soccer team, he was a Club member which ended gender-segregated Cosmo Club membership too, and he was elected Club secretary for Spring 1944. In fact, Mr. Escomel even had a dating life significant enough to be gossiped about in the Daily Illini too. During his senior year, Mr. Escomel played the role of Taberno (the tavern keeper), in the 1947 Spanish Club performance of “The Devil’s Bottle”. And Mr. Rafael La Rosa, (M.S. Animal Husbandry, 1944), of Lima, was a Cosmopolitan Club member too. Mr. Ernesto Cuellar, (Architectural Engineering), of Lima, may not have left many records behind. While, Mr. Alipio Cuellar, (M.S. Dairy Husbandry, 1946), of Lima, was inducted into the honorary agriculture fraternity Gamma Sigma Delta, in 1946. Mr. Luis A. Macchiavello, (Chemical Engineering), of Miraflores, gave a talk about his experiences fighting in the Spanish civil war to the American Youth for Democracy Illini chapter in 1945, he performed music and skits with fellow Latin American students as part of the 78th Founder’s Day gala at the Illini Union, and he gave at least one interview with the DI for person-on-the-street piece about class registration in 1946. A 1951 Illio profile photo of Mr. Erwin J. Goldfarb, found in Record Series 41/8/805. A 1952 Illio profile photo of Mr. Adolfo Chong-Leon, found in Record Series 41/8/805. A 1967 Illio profile photo of Mr. Jorge J. Haaker, found in Record Series 41/8/805. Mr. Erwin Joe Goldfarb, (B.S. Mechanical Engineering, 1951), of Lima, was interviewed at least once by the DI, for a person-on-the-street piece about student reactions to merchant marine members being included in the GI Bill. While Mr. Adolfo Chong-Leon, (B.S. Mechanical Engineering, 1952), of Sullana, and Mr. Jorge Jose Haacker, (B.S. Civil Engineering, 1967), of Lima, may not have left many records behind. Since 2012, the Peruvian Students Association and Friends (previously Peruvian Students Association) has been connecting Peruvian Illini and non-Peruvian Illini to promote Peruvian and other cultural exchanges across UIUC, organizing campus talks, cooking classes, and other social events across campus. Are you a Peruvian Illini? Do you know someone who is? We’d like to hear from you! Please send us a message or leave a comment below. We want to include you and your story, as we celebrate the first 150 years of the University of Illinois. “Martin Tuttle Chamberlain”, The Semi-Centennial Alumni Record of the University of Illinois, Edited by Franklin W. Scott, page 177. “Hale Plahn Daugherty”, page 529. ” Porter George Winerals”, page 528. “Traverso Carlos Luis”, page 670. “Dasso David”, Directory, page 156. “Dasso Luis”, Directory, page 156. “Boza Hector Julio”, Directory, page 69. “Huaco Sergio Arturo Huaco”, page 321.